Derek Clark, a powerful and inspiring motivational keynote speaker knows firsthand that children in the foster care system deserve compassion, respect, validation, love and security. Every professional working with children and youth in the foster care system has a purpose; to make sure that each child feels important, to maintain their dignity, to feel secure, and to know that their past does not have to infect their future. 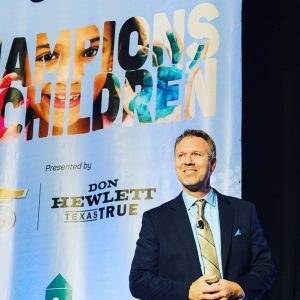 Foster care expert Derek Clark is a popular motivational speaker and trainer for child welfare professionals, social workers and foster parents. His programs provide alternative ways to understand why children behave and deal with child abuse, grief and trauma in the ways that they do. Social worker / case worker turnover hurts the children in foster care. These precious children need someone that will be committed to them as well as looking out for the child’s best interest. We have to do better for the child! Derek isn’t just another “rah rah” motivational speaker, he is unique and solution oriented as he’s had to overcome brutal and extreme adversity in his life. At five years old, he was abandoned at a psychiatric facility and then placed into the San Francisco bay area foster care system where he would stay for the next thirteen years. Derek suffered horrific child abuse and had many behavioral and emotional problems but was able to overcome his adversity and become a victor in life. With Derek’s unique insight based on his experiential knowledge and positive outcome, he’s become a popular speaker / trainer for many state and county agency conferences such as the department of human services, department of children and family services, family court and circuit court summits, child protective services, child abuse and neglect prevention conferences,department of social services conferences, social worker conferences, law enforcement conferences, foster care conferences, child welfare conferences, mental health conferences, foster parent conferences, juvenile justice conferences and probation conferences. His inspiring programs Disable the Label, Resilience to Redemption, Trauma to Triumph and Never Limit the Potential of a Child have evolved from the trenches; a sharing of knowledge and experiences from Derek Clark. His knowledge and understanding will help generate hope and restore dignity to the young people. His presentation will also give you a personal glimpse into his foster care journey and the keys reasons why Derek did not become addicted to drugs or alcohol, incarcerated, or dead. This is his story of resisting violence, shame, rejection and reclaiming his greatness. Like Derek, most children are in the foster care system because they were victims of child abuse through physical abuse or sexual abuse or their parents may have substance abuse issues. The child abuse statistics are incredibly high and the occurrences continue to increase. This is an outrage and every precaution should be taken to prevent child abuse and to protect these precious innocent children who are relying on us to provide them a secure environment. As professionals in the child welfare, we will explore how trauma has been grappled with by kids of all ages who are navigating the foster care system in search of a sense of belonging. We will also describe how children and youth are viewed through the eyes of adults who often know them only through a short window of time. The details of responses, including resistance, consist of the physical, emotional, mental, relational and spiritual processes that run parallel to that which is easily observable. A progressive understanding is gained through eliciting the often-concealed yet ever-present resistance that serves to preserve the dignity of a young person who may be faced with dignity-stripping circumstances. Best practices – ethical practices – must include the heightened awareness of our language customs in the social service field and must have a solid foundation rooted in our knowledge of grief, loss and traumatic experiences. Children and youth in foster care that have gone through all kinds of child abuse are gathered disproportionately inside the justice system and are taking psychotropic medication at rates approximately 60% higher than that of kids in the general population (Lambe, 2009). Derek’s program offers an honest view of a child’s experience growing up in the foster care system through his adult perspective, and a framework for professionals to view those experiences. Our belief is that when the adults who touch the lives of children in the child welfare system collectively respond to them differently, the system itself will profoundly change. It is primarily through the story of Derek Clark’s personal experiences of abuse and neglect, being rejected by his biological family and growing up in foster care that we will begin to recognize and address the responses and the resistance to adversity, past and present, that are displayed by youth in care. The utilization of a Response-Based Approach to the experience of family separations and foster care experiences is intended to provide an alternative view to a systemic perception of deviance, pathology, and defiance. A review of grief and loss literature suggests that family separation, regardless of the justification(s), creates an experience of loss that is under-acknowledged in terms of positive social responses within the system of foster care. Grief through abuse and neglect can become complicated and confused when it is layered upon the existing ambivalent feelings from previous traumatic experiences, neglect or abandonment. Further to this, we know that the ways in which children and youth respond to and resist these experiences of adversity often receives a pathologizing social response from involved professionals, many times creating further harm. Some examples of harmful social responses may be assessing, diagnosing, and medicating kids for ‘behaviors’ that could otherwise be understood as responses to grief, loss, and/or trauma. Furthermore, statistics clearly indicate that the outcomes for youth in the foster care and child welfare system are not meeting the objectives of the professionals who are commissioned to care for them. The child abuse statistics and facts, as below, are clear: neither the kids are safe nor are the professionals in the child welfare system satisfied. 25th of 27 among developed nations based on the rate of child deaths from physical abuse and neglect. Beyond Derek’s own experiences, he draws from the richness of understanding that he has been invited to witness by youth and colleagues who join in solidarity to create change.